“This Pope doesn’t ‘do’ doctrine. His particular vocation as Supreme Pontiff may not be established for many years”. The Pope is not able to commuicate with Lombardi who is the director of communication in the Vatican. The Jesuit Pope face subordination in the Vatican. The Catholic Herald in the UK write about a Pontiff who is “confused”. If you are puzzled, even disoriented by the Holy Father’s conduct of his pontificate (and I stress at the outset that what follows is not intended as an attack on it) you may be reassured by an article in this month’s National Geographic magazine, which contains some possibly indiscreet remarks by the Pope’s spokesman, Fr Federico Lombardi, which indicate that you are not alone. This editor is as confused as the Pope, thiniking his church will save him. SourceL The Catholic Herald, UK. It is interesting that a leading Catholic newspaper quoting the director of communication in the Vatican, calling Francis “confused”. There seems to be some “holy confusion” in the camp of the Roman Catholics. I can only add that a anyone who pray at the Western wall of Jerusalem together with an Imam, is not only confused. He is completely spiritual blindfolded. First: The Western wall is the holiest site of Judaism. The Muslims occupy the Temple Mount on top, and occasionally throw stones down on the Jewish worshippers. While the Pope and the Imam are permitted to pray together at the Western wall, Jews who tries to pray on top quickly gets arrested. Second: A Christian shall not pray in any other name than Jesus. In what name did the Pope pray together with the Imam? We have seen Francis praying towards Mecca inside a mosque in Istanbul. I will not be surprised if the Pope and the Imam prayed together to “allah”. If they prayed in two different names, why at all pray together? May Jesus the Messiah have mercy on all who have been deceived by the papacy. Amen. I remember a picture years back after 9/11 that showed the Pope kissing the Q’uran. That Pope was confused also, as was my die hard Catholic oinline friend whom I corresponded with that also saw the pic. I thought Catholics claim the Pope, whomever he is at the time is infallible. Some of the Popes have been raving mad. Here we migth have a Pope who has displayed the early signs of Alzheimer. He was talking about the separation wall. You are adding to the confusion. Please leave your darkness, and surrender to the Kingdom of light. Fr Lombardi said he is confused, not Pope Francis. 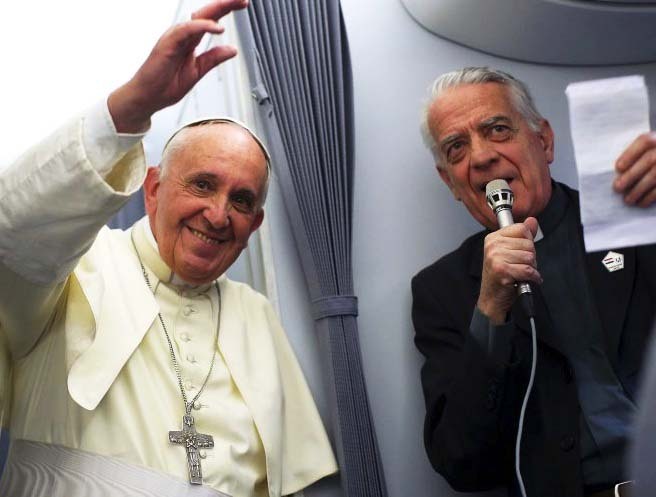 Fr Lombardi replied: “Confused.” He described the contrast between the way Pope Benedict would give an account of a conversation with some world leader and the way Pope Francis does it. Please read all of the article to find out why Lombardi is confused. I am honored that you still read this blog. But why are you continuing to write comments, after you have promised the readers to leave? “So, Father,” the Argentine asked, “how do you feel about my former boss?” Managing a smile, Fr Lombardi replied: “Confused.”..
Men with power often communicate by using understatements. If Lombardi had said: “The Pope is confused”, the Director of Communication would have been transfered and replaced. Let there be no doubts. A Pope who is not conserned about doctrines, is by all standards a confused person. He will wave in all kinds of directions. The confusion in the Catholic camp will not go away…. You still haven’t read all of the article. And yes I do read your articles and will try to correct your misunderstandings what you read and think about the Catholic faith. This article in an open criticism of a Pope who seems to be confused about Catholic doctrines. Regardless if the Pope is confused or not, there is a lying claim at the end of this article: “The Church will save us”. The Roman Catholic Church claims to be “Holy” and going for mass and consuming the Eucharist is what saves a man. From the Catholic Herald: “And don’t be upset by the Pope. Popes come and popes go. A great one is a wonderful bonus: we just had two in a row. But it’s the Church we depend on.” . The truth is that no one will be saved by any church. They can only be saved by knowing and abiding in truth. Jesus said: “I am the truth”. The confusion in the Roman Catholic camp is a never ending story. The Catholic Church agrees with you that Jesus is Truth and that we are saved by Jesus Christ who died for our sins. The Catholic Church also takes all of Scripture in consideration. Holy Scripture does say that in order to be saved, you must be added to His Church, does it not? Jesus is the Head of the Church and we are the members of His Body the Church. That is how Fr Lombardi must be understood – with Catholic glasses on, looking at the big picture. All the people who were baptized on the day of Pentecost, and added to the Church, surely remember their baptism. Do you? To take a Bible verse from here and there, and say “there it is”, is not going to save anyone. A person do not get saved in the church. He was saved, and than added to the Church.